Every year, St. Edward’s chooses a Common Theme that creates a conversation across campus and guides programming for the coming year. We also choose a book that elaborates on this theme. All first-year students read the book over the summer and discuss it in their classes in the fall. 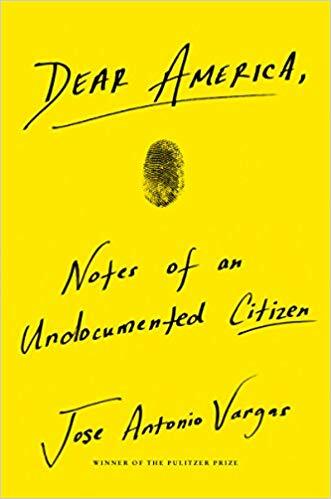 We're excited to announce that our incoming students will read Dear America: Notes of an Undocumented Citizen by Jose Antonio Vargas and our Common Theme is Citizenship. My name is Jose Antonio Vargas. I was born in the Philippines. When I was twelve, my mother sent me to the United States to live with her parents. While applying for a driver’s permit, I found out my papers were fake. More than two decades later, I am still here illegally, with no clear path to American citizenship…. I am only one of an estimated 11 million human beings whose uncertain fate is under threat in a country I call my home. At St. Edward’s, one of our goals is to confront critical issues in society and seek justice and peace, per the institutional mission. We look forward to confronting this year's critical issue with you next fall in class, at events related to the theme, and through service. For example, watch Jose Antonio Vargas discuss what it means to be a citizen to him. Learn more about how the Common Theme is integrated into the first year experience. All freshmen are required to attend the Common Theme speaker on the evening of October 10th. More information to come. One of the most important things we hope to do as a university is create a love of learning in our students, and the first part of that happens with the Freshman Seminar common text, a book we ask you all to read over the summer. Our committee of faculty, staff, and students has chosen Dear America as this year’s common text. As you read the common text this summer, don't read as if it is a textbook. There's no need to memorize any facts. Instead, think about the issues Dear America raises. Make notes in the margins, mark passages that stand out to you, and write down questions you have. That way you will be well prepared to write about the book in class this fall and to participate in discussions. You will also have opportunities outside of classes to think about the book and the common theme by attending screenings of documentaries, hearing lectures by experts, and going on field trips. Email alexb [at] stedwards.edu with any questions about the common text or Freshman Seminar. And again, welcome to St. Edward's. Fall 2019 events will be announced soon. This interactive workshop will be run by our Office of Diversity & Inclusion and will introduce students to concepts like identity, intersectionality, and ally-ship. This documentary chronicles Trevor Noah’s rise to fame as a comedian in South Africa. Facilitated discussion to follow the film. Our speaker this year is artist, activist, and documentary filmmaker Eliaichi Kimaro. A Lot Like You follows Eliaichi Kimaro’s journey to better understand her mixed race roots and her father’s culture in Tanzania. Facilitated discussion to follow the film. A Hamilton-inspired event organized by our Utopia/Dystopia Learning Community, and benefitting St. Edward's University Food Co-op. All Freshman Seminar classes will have the opportunity to see this fall’s play at our own Mary Moody Northen Theatre. Join the Center for Ethics & Leadership and the MMNT as they discuss the play Men on Boats. Book: Where Am I Eating? Read about three freshmen who explored food justice in their communities. Trip: 28 students and three faculty members travelled to South Africa to explore justice, mercy and how these issues relate to race. Trip: Learn how three students built on their Common Theme trip to Bangladesh by continuing to stand up for human rights.